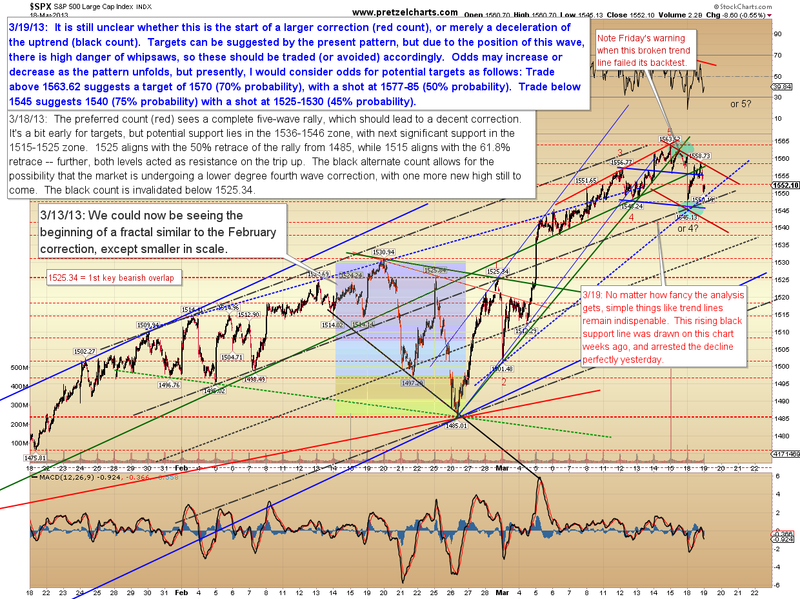 Pretzel Logic's Market Charts and Analysis: Bears Want to Know: Are We There Yet? Bears Want to Know: Are We There Yet? Yesterday saw a solid gap down after the weekend Cyprus news, but buyers appeared immediately, and the market rallied strongly into the afternoon, before running into some selling again into the close. The question everyone wants answered now is whether this is merely a low-degree fourth wave correction (a deceleration of the uptrend) or the beginning of a larger shift in trend. Let's discuss a few factors relating to both. The first salient point is the fact that the ensuing rally was able to overlap 1555.74, which is the potential bottom of a first wave down. In the Elliott Wave model, this is significant because it eliminates certain possibilities -- specifically, it eliminates the possibility that the ensuing rally was a fourth wave correction to the decline. That gives the decline the appearance of being three waves (an ABC decline), which is typically the sign of a correction to an ongoing trend. It's not entirely clear-cut in this case, though, because a series of first and second waves could overlap the 1555 price territory without violating the rules. Yesterday I suggested we give equal weight to both counts, and I still think it's too close to call. However, given the overlap at 1555, the position of the decline within the larger waveform, and the fact that the trend should generally be given the benefit of the doubt, one might consider giving very slight odds to the black count shown on the chart below. 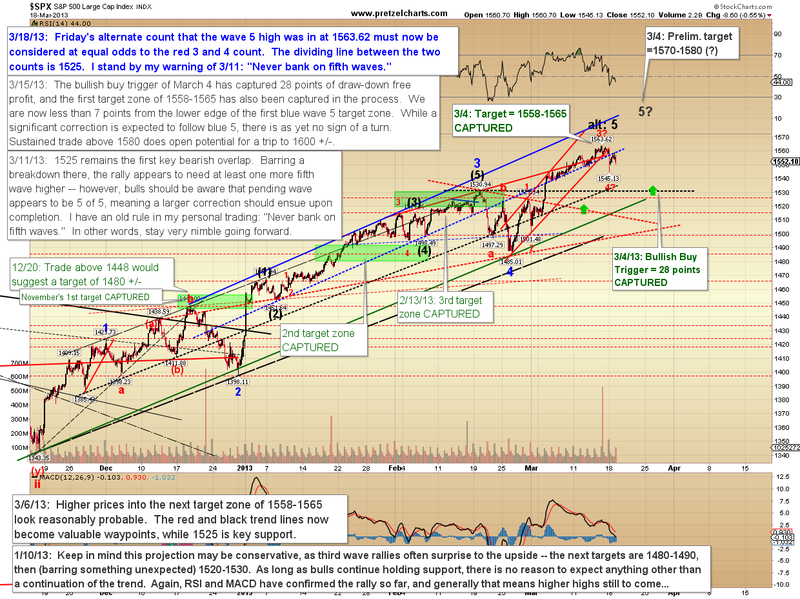 Trade below 1545 would start to open things up for the bears, while trade above 1563.62 would confirm the black count. I've also added a series of if/then target equations to the annotation box, along with my interpretation of the relative probabilities for each target. Those probabilities are read given what's in the charts right at this exact moment, and thus could increase or decrease as more information becomes available from the market. 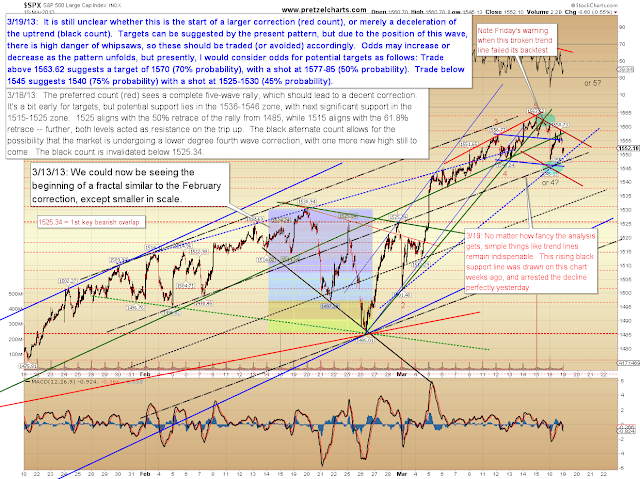 The hourly chart is unchanged from yesterday, and the alternate count still remains a very real potential. 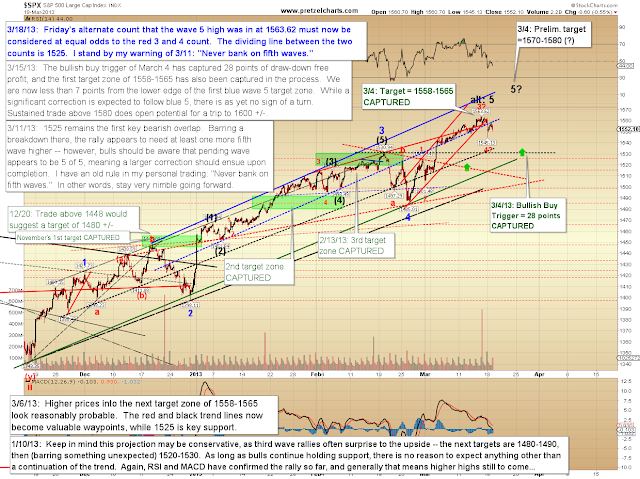 In the event of the alternate count, minimum preliminary targets with the market in its current position range from 1485-1525, but could extend lower and would have to be adjusted in real time. The long-term chart of the S&P 500 (SPY) shows that the market continues to push against the prior long-term peaks. While I haven't annotated the chart with a wave count, I have noted on the chart that there are two pivotal price points to the downside. As we just discussed, the peaks and troughs of potential first waves are important in Elliott Wave -- so I've noted the last two prior assumed first wave peaks. In conclusion, the market only answered one question yesterday: there were indeed buyers waiting -- so bulls didn't appear too anxious to run screaming for the hills just yet. There's a lot of ambiguity in the short-term pattern, but from a near-term perspective, the overlap at 1555 should give bears pause ("paws"? 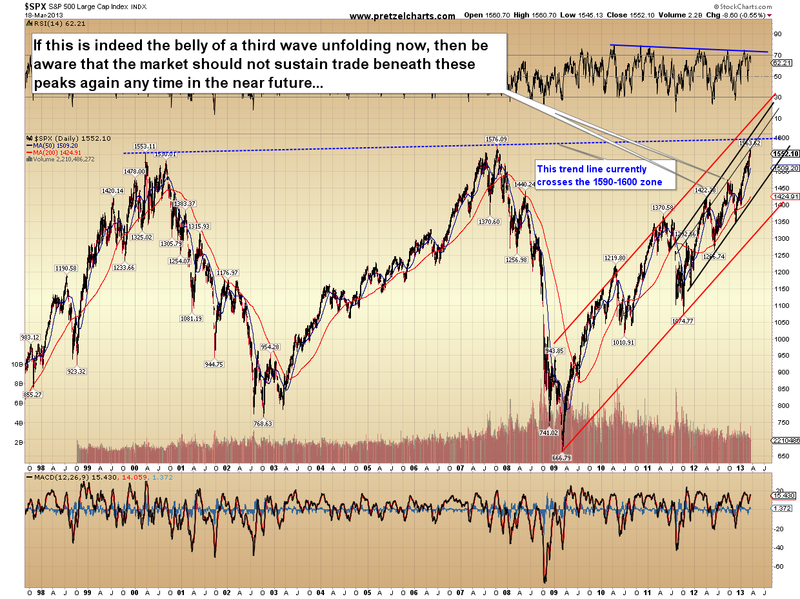 ), because we have not yet seen an impulsive move (a five wave form) in the downward direction. Meanwhile, at higher wave degree (longer time frames), it is still anticipated that the rally has either reached or is approaching an intermediate peak. And as I discussed in detail on Friday, I still believe the FOMC meeting has the potential to be significant. In any case, the turn I’m anticipating is not presently expected to be a long-term peak, but if my intermediate wave counts are correct, should still lead to a good correction. Trade safe.